Interestingly, Duelling has been a competitive shooting event. 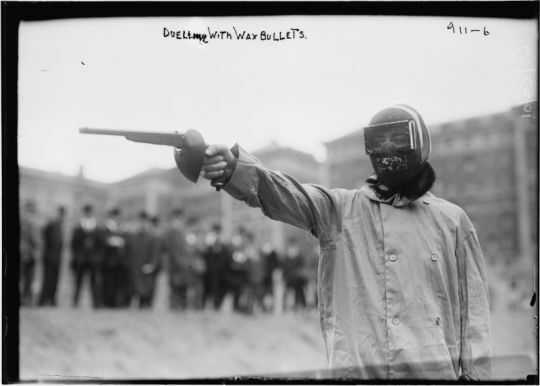 One of the lesser known Olympic events, pistol dueling was a popular sport in the late 19th and early 20th centuries. It was certainly not the deadly past time of generations earlier, where young gentlemen killed each other over matters of honor. Rather pistol dueling had transformed in a safe sport. Conventional pistols were used, however they fired cartridges with wax bullets which lacked gunpowder, the wax bullet being propelled by the force of the primer only. Contestant wore a mask to protect the face, and the pistols had special shields to protect the user’s hands. Pistol dueling was introduced in the 1906 Olympics, but was discontinued after the 1912 Stockholm Olympics. A poll conducted before the 2000 Sydney Olympics showed that 32 percent of respondents would like to see dueling pistols reinstated as a sport. So force on force was used as a competition shooting event in the Olympics over a century ago. Here’s yet another example of competition shooters doing something long before tactical types found it cool.